From humble beginnings in old Allegheny City, now Pittsburgh’s North Side, the Croatian Fraternal Union of America, Hrvatska bratska zajednica, has grown into one of the nation’s leading fraternal benefit societies. From a membership of less than 300 in 1894 to an organization with approximately 60,000 members worldwide, our assets in 120 years have grown from $43 to remarkably approaching $400 million. The history of the Croatian Fraternal Union actually coincides with the history of the Croatian people in North America. From the beginning, when an itinerant young newspaperman came to Pittsburgh from Chicago in the late fall of 1893, Zdravko V. Mužina attracted more than 300 people to a meeting on Jan. 14, 1894, to organize a mutual benefit society for all Croatians. While only a handful actually signed up as members and began payment of dues to provide life insurance protection along with accident and health insurance for themselves and their families, Mužina, undaunted, enlisted the aid of Petar Pavlinac and Franjo Sepić to call a meeting of six independent societies on September 2, 1894, to form the “Croatian Association.” The new organization operated under that name until 1897 when a new charter was issued in the name of the National Croatian Society(NCS). It remained the NCS until 1926 when the Croatian Fraternal Union was borne out of the merger of four independent societies – the National Croatian Society, the Croatian League of Illinois of Chicago, Illinois, the St. Joseph Society of Kansas City, Kansas and the New Croatian Society of Whiting, Indiana. Interestingly, when the Society was founded in 1894, unable to locate 12 Croatians who were citizens of the United States, a requirement of the statute to incorporate a fraternal benefit society, the Society utilized outside affiliates. Therefore, of the original 12 signers, eight were Croatians and four were Czech and Slovak friends who volunteered their services to launch the first Croatian benefit society. By 1900, the CFU had grown to 8,000 members and by 1912, the Society included 30,000 members. The first Home Office of the CFU was rented quarters located on East Ohio Street in Pittsburgh’s North side. Authorized at the 1909 convention, the first Home Office building and printery to be owned outright by the old National Croatian Society was located at 1012 Perry Street (later named Peralta Street) in Allegheny City, PA. The building cost $17,000 and the society moved into its new quarters on May 1, 1910. This building was utilized until 1928, when a new Home Office building was built at 3441 Forbes Street in Pittsburgh’s Oakland district. The CFU ran its operation in the Oakland Home Office from 1928 through 1961 when the present Home Office structure was built at a cost of over one million dollars in Wilkins Township, PA. 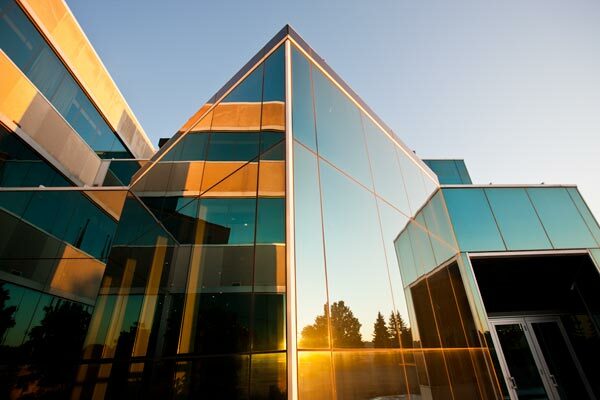 This structure underwent a significant interior renovation in 1981. In order to better serve our members and to stand as a testament to our history and heritage, the CFU augmented its property with a multi-million dollar expansion project that was completed in 1994, the 100th Anniversary of the Society. The current Home Office is situated at 100 Delaney Drive, Pittsburgh, PA 15235. The CFU Home Office now includes office space for the Executive Board, employees, editorial department, recording studio, libraries and extensive museum. Until the 1904 convention held in St. Louis, the Society used private newspapers for the publication of official notices and the lodge directory. The delegates to the 1904 convention recognized the need of a publication solely dedicated to the membership of the Society. 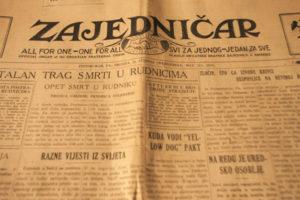 This resulted in the CFU publishing its own official organ as a monthly newspaper until 1909 when it became the weekly “Zajedničar,” a publication of four pages. 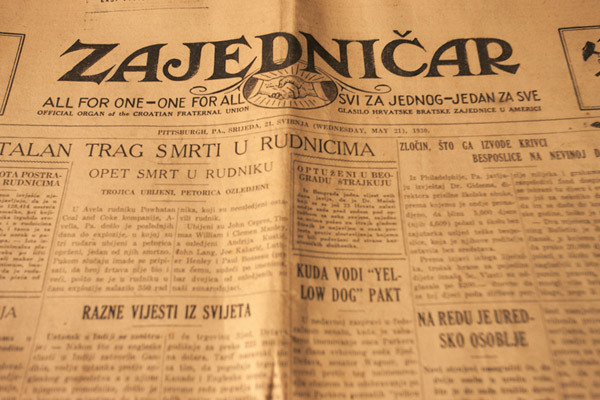 The “Z,” as it is commonly referred to by CFU members, was later changed from its old letterpress format to today’s attractive tabloid, averaging 20 pages in both Croatian and English languages, highlighted by the liberal use of color. In keeping with the times, the “Z” is now available electronically upon a member’s request. The CFU operated under the old assessment principle until the 1912 convention, that is, each member was assessed each month on the basis of deaths occurring in the previous month with a small sum added for administrative costs. At the 1912 Convention in Kansas City, KS, the delegates adopted a table of rates which provided for payment of dues based on the age of the member and the amount of insurance carried. The adoption of the rate table came in the nick of time because shortly after the convention, all states enacted laws that required fraternals and other insurers to adopt level rate tables for collection of insurance premiums. Further changes in the rate tables were made in 1922 and continued until Jan. 1, 1985, when the CFU was again in the forefront and adopted the 1980 CSO (Commissioners Standard Ordinary) mortality rate tables that were recommended by the National Association of Insurance Commissioners. Currently CFU utilizes the 2001 CSO mortality rate tables with revisions. Recognizing that immigrant societies and organizations did not pay enough attention to the younger generation, Josip Marohnić motioned at the 12th Convention in 1915 to establish the Junior Order Department by stating, “We should always keep in mind that by organizing our young generation we will make the Croatian national conscience enter the hearts of all young people and remain there, that we will protect our children, educate them and make them become the future members of the National Croatian Society… We who are older shall go one after the other, and it is our duty to take care of the descendants who will fill our ranks in the future and represent honorably our Croatian cause in this country.” There are currently 213 Nests in existence across the United States, Canada, and Croatia. At the 1918 convention, a Croatian orphanage in the United States was established and later became the CFU Children’s Home where hundreds of orphans of deceased CFU members were reared into adulthood. The home was closed by the 1967 convention when the number of orphans being cared for in the Children’s Home was reduced to only a handful. The property in Des Plaines, IL was sold in 1970. During the Depression of the 1930’s, when more than 12 million Americans were jobless, the hard times took their toll in the CFU as almost a third of our total membership was on Automatic Premium Loan options, or “Reserve” as it was popularly known. Many people lost their life savings with the closing of banks, but the CFU was never in danger during this crisis despite thousands of dollars’ worth of bonds being in default. When World War I erupted in 1914, it had a direct effect on our membership, most significantly after the entry of the U.S. into the war in 1917. As our young Croatian Americans answered the call to serve their new nation, many of our members made the supreme sacrifice of giving their lives for their country. More than one-half of CFU assets – $145,000 – was invested in War Bonds and through substantial contributions made to America, British, Russian, Czech and Polish Red Cross organizations in support of the U.S. war effort. Many of our members and other Croatians suffered embarrassment when they were jailed as war aliens because they came to the U.S. from Austro-Hungary, which was an enemy nation. In Canada, hundreds of Croatians were interred a few months after the war began. Directed by the National Board, National President Joseph Marohnić pled the case for the interred Croatians, and all but a few of those jailed were released by the Canadian government. Because of prohibitions against dealing with enemy countries, our Society was unable to pay death claims to beneficiaries in the Homeland. During this embargo on such payments which lasted into the early 1920s, almost a quarter-million dollars was deposited with the U.S. Alien Property Custodian for beneficiaries in the old country. Eventually, every cent was distributed to the proper beneficiaries. In the war years, during the short period of October 1918 and Jan. 20, 1919, five hundred thirty-one members of the National Croatian Society died of influenza when a flu epidemic broke out in the United States. In order to cover payment of the large amounts due to death claims, the Society levied an extra assessment of $4.50 on every member and suspended enrollment of new members for the duration of the flu epidemic until April, 1919. The unfavorable political situation in the Homeland during the period between the two World Wars, had a significant influence on the political activities of American Croats. The Supreme Board of the Croatian Fraternal Union dedicated its session in 1928 to the disturbing situation in Croatia and gave its full support to the political leadership in Croatia. Before the outbreak of World War II, CFU Convention resolutions were passed favoring actions in the Homeland for the good of the Croatian people. Nonetheless, the members were fully aware that their organization was an American institution and that in turbulent times, its destiny would be closely linked with their new American Homeland. At the beginning of World War II, on July 16, 1941, the Croatian Fraternal Union sent a message to President Roosevelt stressing that Croats are loyal citizens of the USA and were convinced that victory of the Allies will be the victory of their old country. They fully supported the politics of the USA and its Allies. 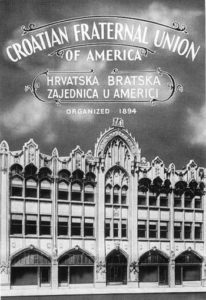 A meeting of the Congress of American Croats comprised of leading figures of American Croatians, including the CFU Executive Board, was convened in New York in the summer of 1942. Guided by their devotion to their homeland, America, and their sincere love of Croatian people, it not only offered political guidance to the vast majority of Croatian immigrants, it also influenced American public attitude towards the Croatian immigrants and Croatians at large. The CFU was very active in war relief efforts. The Croatian Fraternal Union alone invested six million dollars, almost half of its assets, in War Bonds and launched a campaign among immigrants for the purchase of War Bonds. There was hardly a member of the Society or an American of Croatian descent who did not invest the largest part of his or her savings in War Bonds. The exact number of Croatian immigrants and their sons fighting in the American forces is not known. However, among the members of the CFU, 15,000 fought in the American forces, in other words 23% of the total membership. Of these, 308 were killed in the war. The CFU members engaged in the war enjoyed special benefits. It was decided by many fraternal organizations and insurance societies that the beneficiaries of their members killed in the war would receive only the premiums paid to the organization, or their “reserve.” The CFU, on the other hand, decided by referendum that full death benefit would be paid out to the beneficiaries of the members killed in the war, and full disability benefit to the disabled veterans. In its 100+ year old history, the CFU has always supported the Croatian people and their struggle for freedom. During the latest tragic events in war-torn Yugoslavia, the Croatian Fraternal Union assisted the Croats morally, materially, and politically in their struggle for a free and independent Croatian state. When the communist system of the former Yugoslavia disintegrated, the CFU upheld the democratic processes in Croatia. In a letter to the President of the Republic of Croatia, Dr. Franjo Tuđman, CFU National President, Bernard M. Luketich, affirmed CFU’s support of all efforts to establish a new democratic government. At the 18th CFU Convention in 1991, the delegates initiated the establishment of the CFU Croatian Humanitarian Aid Fund into which $50,000 was remitted by the Convention itself, and another $6,000 was raised by the delegates during the Convention. This resulted in the greatest outpouring of humanitarian aid by CFU members and friends. Numerous supplies were shipped from various lodges to the Homeland and added to the Home Office totals, amounting to more than $150 million in humanitarian aid from the CFU. Members and friends contributed over $1,300,000 to the Fund to help pay for purchase of supplies and costs of shipping. The Croatian Humanitarian Aid Fund remains as a fraternal program. In addition to the Humanitarian Aid Fund, the CFU entered into an agreement with the DORA foundation in the Old Homeland to provide financial support for war orphans. Throughout CFU’s collaboration with the DORA foundation, over $350,000 was collected and distributed to war orphans who lost at least one parent during Croatia’s war for independence. Today’s Croatian Fraternal Union has come into being as a result of numerous mergers, the first and most important occurring in 1926 when a Special Convention was called to ratify the merger agreement between the National Croatian Society, the Croatian League of Illinois and the St. Joseph Society. The first convention of the newly merged CFU was held from May 3 to May 22, 1926, the longest on record. 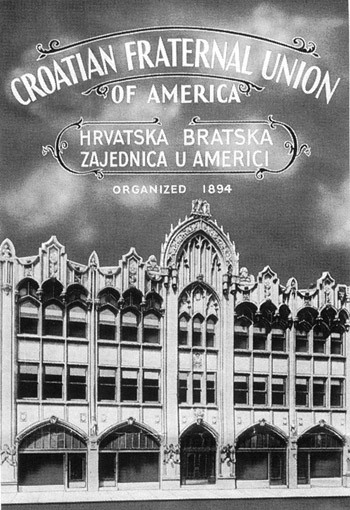 Since that time, the Croatian Fraternal Union of America has become a ‘melting pot’ of sorts for various Croatian and ethnic organizations. CFU has benefited from mergers including those with the Slavonic Croatian Union, Calumet, MI in 1939; Sloga Fraternal Life Insurance Society, Milwaukee, WI, in 1994; the Canadian branch of the National Fraternal Society of the Deaf in 1994; Zivena Beneficial Society, Ligonier, PA, in 1995; Ukrainian National Aid Association of America in 2000; Union League of Romanian Societies of America in 2000; and Croatian Catholic Union of USA in 2006. Recognizing the importance in encouraging and supporting young students in their pursuit of higher education, the CFU Scholarship Foundation, Inc. was founded in 1958. The Scholarship Fund has been established on a self-perpetuating basis and is funded through the creation of endowments and individual donations. Managed by its own Board of Directors, the Foundation has awarded 8,832 scholarship grants, totaling $2,880,355, to deserving students since its inception. The CFU was among the first ethnic fraternals to launch an active sports promotion program among its members. These sports programs date back to the late 1920’s and have been continued to the present day. Tournaments and outings are held on the national, regional and local levels and include: skiing, basketball, golf and bowling. The Croatian Fraternal Union Junior Cultural Federation, organized in 1967, focuses on the promotion of Croatian national folklore among our CFU Junior membership. An annual festival, held in different locations across the United States, Canada and Croatia, features approximately 30 ensembles. In response to members’ wishes to continue participation in tamburitza festivals after age 21, the CFU established the Adult TamFEST in 1987. Like the Junior Tamburitza Festival, CFU members in adult ensembles perform at an annual festival held in a different major city annually. Since its inception, the number of participating ensembles has grown to over 30. 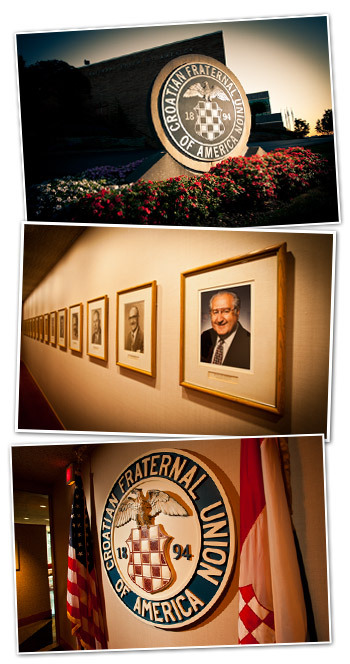 Across the United States and Canada, there are numerous Croatian homes and centers, the majority owned and operated by our Lodges, that exist within the community as a meeting place for members’ fraternal activities. Our membership also takes an active role in the Croatian Churches in their communities. Croatian radio programs operated by our members and supported by lodges and united lodges organizations can be heard, particularly on Saturdays and Sundays, in many cities in the United States and Canada. In addition to hearing beautiful Croatian musical selections, these programs serve as a resource for members to obtain information on upcoming events and other items of interest to our Croatian people. While we are proud of our activities on the cultural side, our basic purpose from the beginning of the Society has been to provide our members with the best possible protection available. In our second century of fraternalism, we continue to dedicate our efforts to offer the most complete, up-to-date portfolio of quality, affordable programs to meet all of our members’ financial needs. This includes the addition of annuity/IRA products in the 1970’s, as well as offering various focused product promotions from time to time. The Croatian Fraternal Union of America has proved to be a true fraternalist organization, based on a program of benevolence and humane relations. The Society shows clearly that even after a hundred years, its membership is aware of its roots, of being part of the Croatian people. Based on these beliefs and principles, the Croatian Fraternal Union of America can look ahead with optimism, expecting yet another century of successful work.